The image of the South as a land of music does not fade with the passing decades. 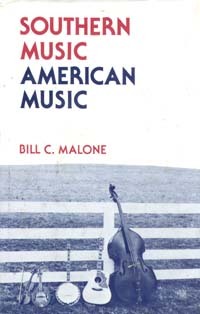 As Bill C. Malone points out in this always stimulating book, music has long been one of the great natural resources of the South and remains one of its most valuable exports. For more than a hundred years much of the music most beloved by the people of this country has been dominated by southern images and southern styles. What would popular music be without the rhythms of ragtime and blues? Without jazz would we really havea n American music? Rock, gospel, country, soulall have strong links with the South. Malone starts with the blending of British ballads and African music that seems to have taken place almost as soon as the South was settled. With the addition of German and other European strains to this base, a geneuine regional music arose. As the North grew more industrialized in the nineteenth century, both the music of the South and the images of a pastoral southern life began to appeal strongly to those who missed the old rural ways, and songwriters and performers in the North drew freely on southern themes. Close on the heels of minstrelsy and the sentimental songs of the Stephen Foster era, ragtime, blues, and jazz spread over the country. Meanwhile ancient British ballads of the southern highlands and spirituals of the southern blacks found favor with devotees of what Malone calls "high art" music. Hillbilly tunes, long ignored except in rural areas, eventually evolved into today's country music and made Nashville one of the major recording centers of the nation. Malone explores these varieties of southern music and many more, showing how they have interacted and demonstrating that commercialization has affected all of them in virtually the same ways. His analysis of the influence of radio and the recording industry is particularly revealing. A most appealing feature of the book is the attention given individual songwriters and performers. Malone's lively and informed appreciation of the music and musicians he describes will delight all those who love the distinctive sounds of southern music. Bill C. Malone teaches in the history department of Tulane University. He is the author of several books and articles on the grass roots music of America.